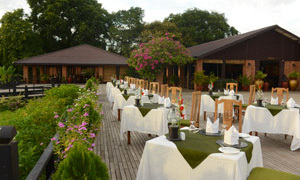 The Bagan Thiripyitsaya Sanctuary Resort is known for its cuisine of the highest standard. 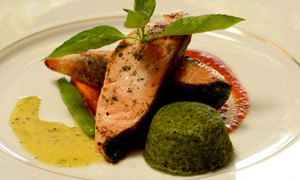 Only the freshest, safest meats, poultry, seafood, vegetables, fruits, and other ingredients are used in food preparation. Organic vegetables and herbs are grown in the Resort’s own vegetable garden. Strict hygiene is observed in the kitchens; all raw food materials are washed and rinsed using only purified water. Various menus, from Myanmar, Asian, Western, to vegetarian as well as low-calorie, are available. 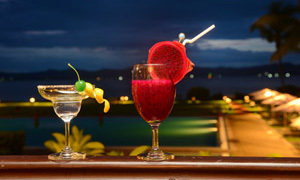 The menu includes homemade fruit and vegetable smoothies, coffee, teas, original cocktails and our selected wine etc. In the morning, breakfast is served on the Terrace looking out to the pool and the Irrawaddy River. Guests can enjoy all-day alfresco dining at the Verandah surrounded by nature. In the evening, the Terrace is transformed to a romantic venue for candle-lit dining under the stars. At sundown, gentle breezes and a golden-peach sky in the distance signal that the Pavilion Lounge is ready to serve guests their alcoholic or non-alcoholic drink of choice. As night comes on, cool music and dramatic lighting create the perfect ambiance for guests to linger and unwind at the Pavilion Lounge. For special dining experiences, Thiripyitsaya can arrange Royal Dinners at the Pagoda Garden, complete with an option of donning Myanmar royal costumes, as well as exclusive dining set-ups at Poolside. Detailed information about menus, charges and other arrangements can be obtained at the Front Desk.